On the upper blocks of Danforth Street, at the corner of Emery Street, sits a pair of imposing brick houses. Built in the early 1850’s for members of a mercantile family who’s history is now a bit vague, they now present a dichotomy of care and neglect. Greater Portland Landmarks 1972 publication says they traded with Buenos Aries. A deed transfer from Samuel to his wife and others dated May 26, 1881. This transfer references 2 people living in Buenos Aries. Built in the Italianate style, 300 at left was Samuel’s home and Andrew’s was 308 at right. The architect is said to have been Charles A Alexander. Little professional or biographical history exists for Alexander. He practiced in the city from the early 1840s until around 1867 when he seems to have moved from the area. He is not listed in Beckett’s. Few of his works remain. The Chestnut Street Methodist church, now Grace, is probably the best known of 7 documented buildings by Alexander extant in Portland today. Perhaps his best known work in Greater Portland is the home he designed for Colonel John Goddard in Cape Elizabeth. The remains of which can be see at Fort Williams Park today. Overall, the 2 homes are identical in plan and massing. Differences are in details with windows and their trim along with ornamentation of the projecting entry bays being primary. 308 Danforth displays a classical closed pediment. The projecting cornice has very fine brackets with dentils in the frieze. The hexagonal cupola has overscaled carved brackets at the corners. The arched windows in the cupola the only ones on the house. 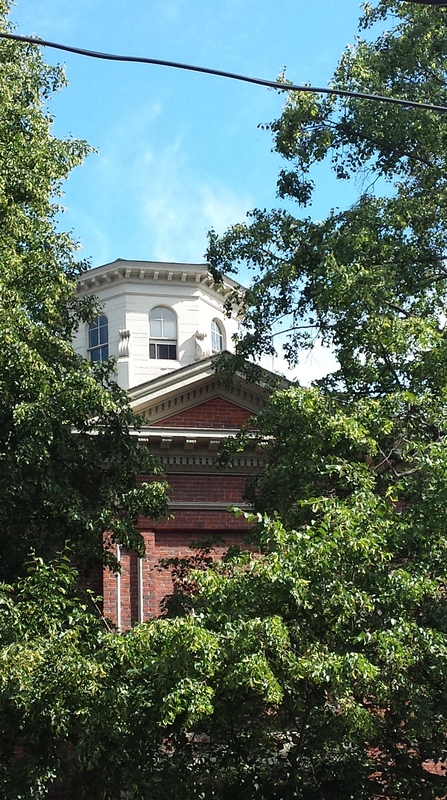 It looks like the siding of the cupola is matched boards which, when properly maintained, have the appearance of stone. 300 Danforth Street has a compressed roman arch capping the entry bay. It is relatively unadorned when compared to it’s neighbor. The house uses round topped windows throughout the second floor with the window in the projecting bay being deeper arched with a finely scaled fan and showing a more developed, hooded, trim. The cupola at 300 is in most ways identical to that of 308 differing only in color and condition. The windows are an area of great difference in the houses. 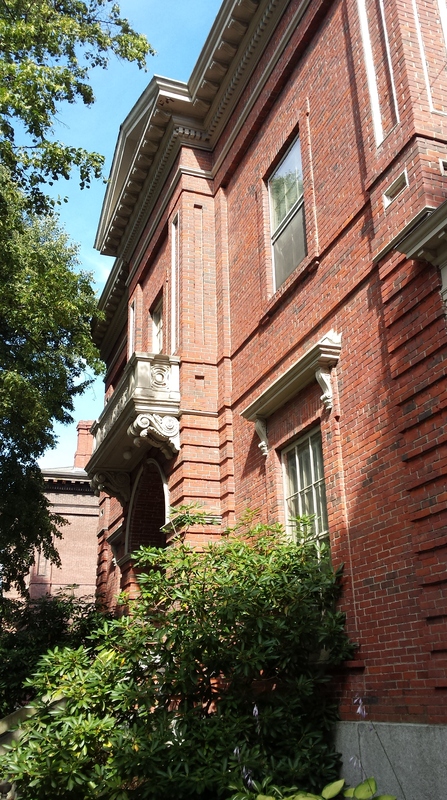 Samuel’s house at 300 has heavily ornamented windows on the first floor with the main facade being paired and fronted with graceful attached Tuscan columns in what looks to be brownstone but is actually painted wood. The windows on 308 Danforth are positively severe in comparison to 300. Simple 6 over 6 double hungs with lovely mullions more fitting the Federal style. No trim other than the gracefully scaled architrave of the cap held by small brackets that mimic the form seen on the cupola brackets. One of the most interesting features of both houses is, I feel, the variety of surface levels, textures and shadow lines in the brick work. 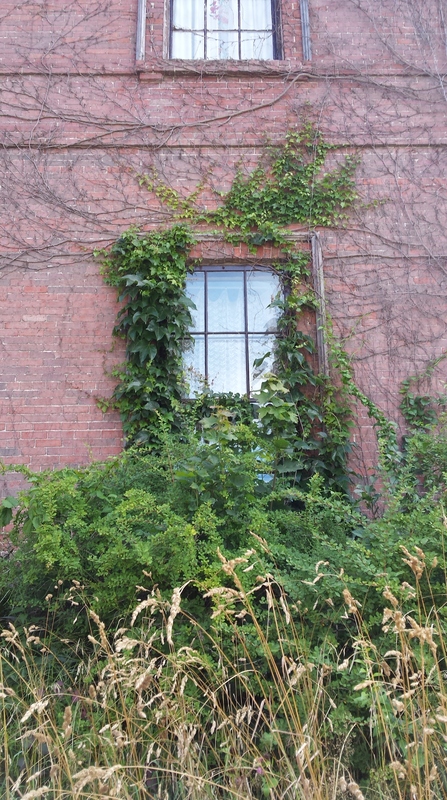 The image above shows how the windows are set in a frame that projects about 1/3 of a brick’s width from the plane of the wall. Also visible above are the belt courses corresponding with the ceiling line of the first floor and window sill line of the second. By slightly offsetting these courses, the architect and builder have created strong horizontal delineation of the wall spaces and defined the vertical levels of the houses. Even more of the bricklayer’s art is seen if we pull back some. From the quoins on the corners of the first floor to the inset panels, some framed with pained wood moldings, it is truly a tour de force of the craft. The balcony above each building’s entrances are attractive. Made of wood painted to mimic marble, they rest on carved brackets that mimic the others on the houses. These may have all been purchased from a catalog of architectural elements. Something just starting to appear with the increasing adaptation to steam power to run saw mills. The details of the balustrade may have come from a pattern book. Today the houses present a dichotomy of condition and care. 300 Danforth is in a serious state of disrepair while 308 is in very good shape. A look at ownership records appears to show 300 to possibly have an absentee landlord. A search of the owner’s name shows them as a practicing neurologist in Portland and in Westchester County New York. 308 on the other hand shows a live in owner who is listed as a WWII veteran. This entry was posted in Architecture, Brick, Charles A Alexander, Danforth Street, Emery Street, History, Images, Italianate, Survivor, West End Walks and tagged Danforth Street, History, images, Italianate, Maine, Portland, West End on August 28, 2016 by alewifecove.